Since VertiRack's introduction of the vertical ladder rack, we have received many requests from surfboard and paddle board riders for a way to carry their boards on the side of their vehicles. Taking what we learned from our experience with side mounted ladder racks, and addressing the unique characteristics of the shapes, sizes and construction of the various board types; VertiRackTM is proud to offer its Vertical Side Mount Surfboard and SUP Rack. board to a Stand Up Paddle board and everything in between. by a large diameter rubber surfboard isolation pad. 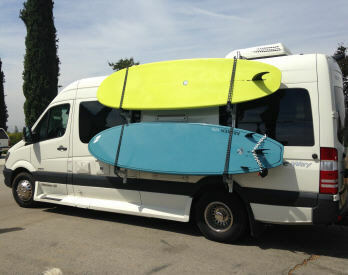 These two parts of the surfboard rack protect your board from damage while in transport. In addition to the above surfboard resting points, the surfboard is securely held in place by our rubber surfboard securing strap. All of these features add up to safe and secure board transport over any distance or terrain. VertiRackTM Surfboard Racks are manufactured in the USA using only the finest materials and components; anodized industrial grade aluminum extrusions for the rack frame and components, high grade stainless steel fasteners, UV resistant polyurethane board support and isolation pads and high strength UV resistant rubber surfboard securing straps. These things and more add up to a rust free surfboard rack that lasts a lifetime. 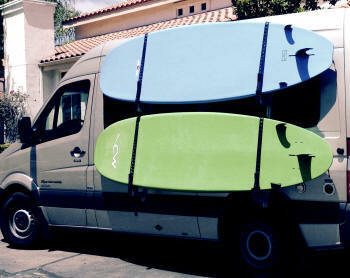 VertiRackTM Vertical surfboard Racks offer the ultimate convenience in surfboard transport. Stowing surfboards on the side of the vehicle makes loading and unloading surfboards from the surfboard rack much easier than it ever was before. adjustability allows fine tuning surfboard placement on the vehicle after the surfboard rack has been mounted. VertiRackTM Manufacturing Co. makes Surfboard Racks and Ladder Racks to fit virtually all vans, truck, trailers and recreational vehicles.